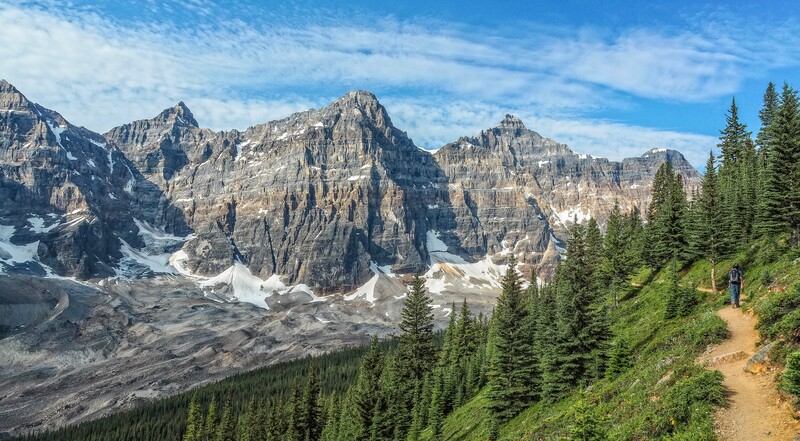 Most visitors to Banff National Park plan to visit Moraine Lake and leave with a photograph resembling the depiction of the Valley of the Ten Peaks on Canada’s twenty-dollar bill: Moraine Lake in the Valley of the Ten Peaks. Some spend a little more time and walk the Moraine Lake shoreline trail. Even fewer venture further, to Consolation Lakes, Larch Valley/Sentinel Pass or Eiffel Lake/Wenkchemna Pass. We’ve hiked the very popular trail to Larch Valley/Sentinel Pass a few times. We finally hiked the less popular trail to Wenkchemna Pass and we’re already considering a return trip during larch season. Be sure to arrive before mid-morning to be assured of a parking spot. The lot was about one-third full when we arrived just before 8:30 on a weekday morning in early July. As we pulled out around 3:30 in the afternoon, vehicles were parked for at least a kilometer along the side of the Moraine Lake access road. Approaching the lake from the parking area, head right along the (probably crowded) shoreline trail until you see a large, wood-framed notice board. Depending on the time of year, one of the notices may require you to hike in a closely-spaced group of at least four people, in keeping with Parks Canada’s grizzly bear management policy. You may wish to confirm the seasonal access requirements on the Parks Canada website while planning your visit. From July through September it’s usually pretty easy to make a group of four right on the spot. Everyone headed to Larch Valley/Sentinel Pass or Eiffel Lake/Wenkchemna Pass hikes the same trail for the first 3 km (2 miles) which takes about 45 minutes. Several switchbacks make the 350 meter elevation gain relatively comfortable. This stretch of the trail climbs through mixed forest, which means it’s in shade throughout the day. Upon reaching the fork, those continuing to Larch Valley/Sentinel Pass head right, while those headed to Eiffel Lake and beyond to Wenkchemna Pass veer left. The next stretch of the trail is less strenuous, gaining about 150 meters over the next 4.5 km (3 miles). Breaking out of the forest for the first time provides a commanding view of a few of the ten peaks and hints at the panoramic views to come. It was fairly early along this stretch that our son spotted a porcupine crossing the trail, only the second time we’ve seen a porcupine during our two decades of hiking in the Canadian Rocky Mountains. We were treated to birdsong and a wide variety of wildflowers as we continued along the trail. In fact, the wildflowers were just about at their peak – maybe a week to 10 days earlier than usual. Despite the warm spring, we encountered several patches of lingering snow. While they were fairly slick in the morning, by mid-afternoon they were turning to slush. Looking across the valley we enjoyed ever-expanding views: glaciers, mountain peaks (each of the ten peaks tops out at over 10,000 feet), glacial till and larches. The trail slowly works its way along the base of Eiffel Peak. Once Eiffel Lake is fully in view, Wenkchemna Pass is visible across the valley. Another small tarn nestles in the valley bottom. We couldn’t find an obvious trail down to the lake, which sits at an elevation about 100 meters lower than the trail. Based on the number of people we saw picnicking here on our return, it seems many choose to stop here to enjoy the breathtaking view of the Valley of the Ten Peaks before heading back down. Since it was just mid-morning, we opted to continue on towards Wenkchemna Pass, pausing occasionally to study creeklets and various rocks and to look back towards Eiffel Lake. We also spotted a Ptarmigan hen and three or four chicks near the head of the valley. From the head of the valley, Wenkchemna Pass appears deceptively near. It reality, it was a bit of a grind as we gained almost 200 meters over less than a km, the steepest part of the trip! We reached the pass a few minutes after 11 o’clock, for a total hiking time of 2.5 hours from the parking lot. We took our time, enjoying a leisurely lunch, checking out the view into the next valley (the Valley of the Ten Peaks is definitely the better view) and photographing a marmot (or two) and ended up spending almost two hours at the pass. On our return trek, we made a short detour to the tarn closest to the base of Wenkchemna Pass. This required crossing yet another snow patch. The tarn was very shallow and appeared to drain towards Eiffel Lake via a small stream. The many rocks at the foot of the tarn were easily spaced for rock hopping. Once we made our way back to the trail, we hiked pretty steadily for an hour and a half get back to the parking lot. One of the highlights of the return trek was getting a slightly different perspective on Fay Glacier than you get from Larch Valley. We encountered about 20 people on the trail between the fork and Wenkchemna Pass. Many opted to turn around at Eiffel Lake so we enjoyed relative solitude at the Pass. This hike would be a great option during larch season and we’d also like to find out what the best trail option is for getting down to explore Eiffel Lake. If you’ve done this hike and know where to drop down to the lake, please leave a comment to let us know. NOTE: To minimize the overflow of vehicles onto the non-existent shoulders of Moraine Lake Road, Parks Canada runs a weekend shuttle bus service during prime larch viewing season. It starts running at 9 a.m. which is pretty much perfect timing for anyone leaving from Calgary at 7 o’clock. Enjoyed reading your account. Just got back from Lake Louise. Attempted Sentinel Pass. Made it up a short way. Too snow bound for us. May try Eiffel Lake next year. Looking forward to reading your account of Bow Glacier Falls and Bow Hut. Thanks for this. We are arriving in Canmore today and may do this hike during our stay. Hope you have a great time in Canmore/Banff. We hiked from Bow Lake to Bow Hut yesterday (actually a bit beyond Bow Hut) and the trail wasn’t as busy as we’d feared. Probably 90% of visitors to Bow Lake just hung out at the lake shore near the lodge, maybe 9% hiked to Bow Glacier Falls and 1% to Bow Hut. It seems that even though Parks Canada has gifted hundreds of thousands with free park passes for 2017, if you choose wisely you can avoid crowds!